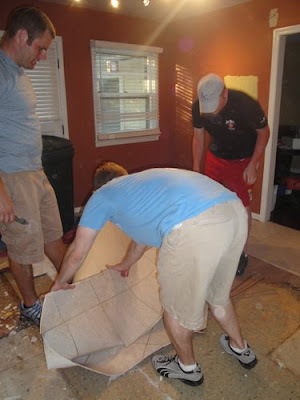 I was incredibly proud of the boys who ripped out the kitchen in less than four hours, and only broke the sink base. 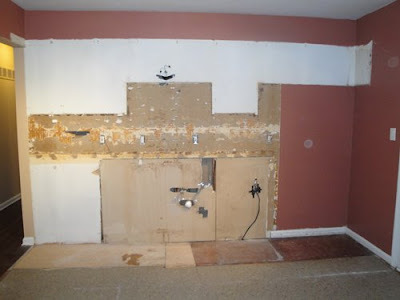 All of the other cabinets came out in one piece, and will be reused in our basement. 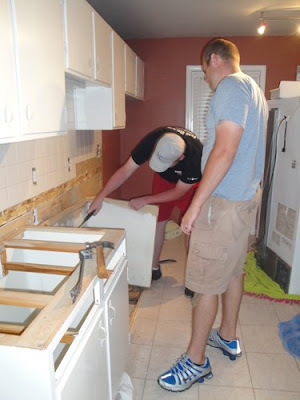 I am so excited to watch the kitchen get put back together. It is going to look great when it is finished! 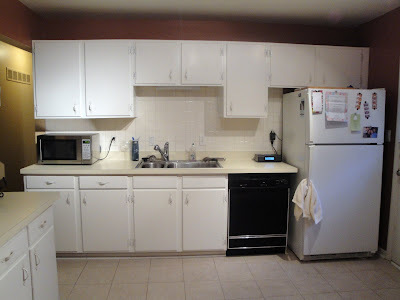 Yes, with a new paint color on the some new cabinet hardware, and new appliances, it might have passed for a pretty decent kitchen, but the layout wasn't extremely functional and there was a serious lack of counter space. 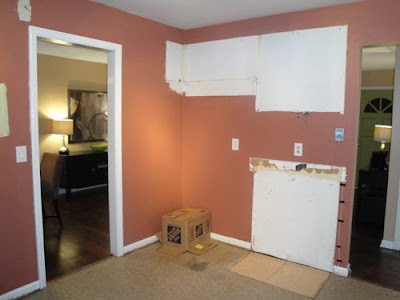 my appliances and countertops were missing. I'll be back with more demo pictures soon! Less than a week until we rip out our kitchen! I seriously can't wait. Today when the hubs and I were making dinner (which yes, was Kraft Mac & Cheese and turkey sausage) we started discussing how awesome it will be when it is finished. And then I started envisioning the craft projects that were definitely going to enter the space. 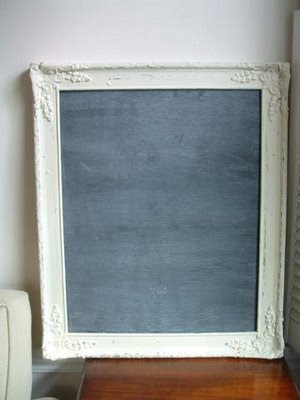 The first thing I would like to make is a framed chalkboard. I found this one through google images, see the blog here. 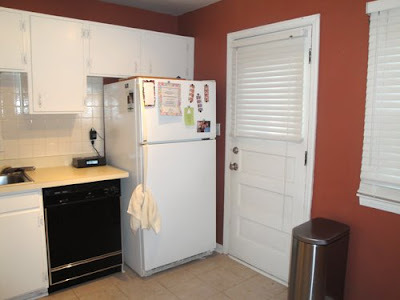 I want to make a good sized chalkboard that we can very carefully attach the side of the fridge cabinet. I thought it would make a great place to write notes, tack up pictures, or display invites and such. Also, I hope to etch some labels on glass jars. 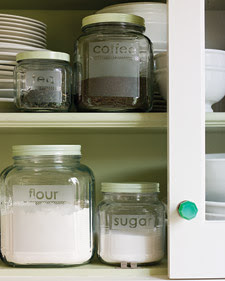 My plans are for a cookie jar to keep on the counter, but I found instructions on Martha Stewart for pantry storage jars. Maybe I'll end up with a cookie jar and storage jars. (That will definitely depend on how well my skills in etching end up being). 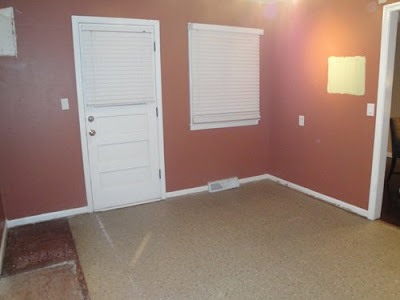 Alright well those are the only projects I've come up with for now, but I am so excited to get started on the kitchen! I give you the Yucca plant. They're back! All of those little green sprouts? Yep, Yucca plants. Apparently the landscaper thought that digging up the top of the plant and then hacking off the root would work. Boy was he wrong. Every little chunk of root that was left in the ground, I'm talking even a chunk that broke off the size of a quarter, has started sprouting a new plant. So instead of 15 plants in the front, we have discovered close to 40 sprouts! The poor hubs has spent countless hours in the yard digging and sifting through the dirt to try and find every last bit of root. Some of the roots are the size of a small tree, so those ones are getting the salt treatment. You can read what others suggest to remove Yuccas here. 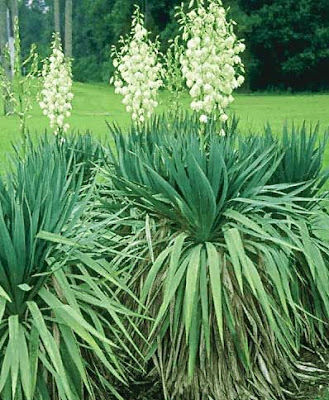 So if you ever consider planting a Yucca in your yard, I beg you to look for other options. Otherwise you might be stuck with it forever! I feel as though I have nothing to blog about right now. Nothing that is really of any interest. I've been a failure at cooking, we haven't really done any projects around the house, and there haven't been any exciting events to really speak of. Other than the fact that my cousins have been like a baby factory. I believe there will be six babies born within a few months of each other. That seems absurd to me, but I suppose if you have a few dozen cousins and second cousins it is bound to happen. My latest and greatest house purchase? Thats right, a step stool. I told my dad it wasn't blogworthy, but with the lack of alternatives, I decided it would do. Seeing that I can't quite reach the top shelves of the cabinets now, I figured that when our new cabinets come in (that go to the ceiling) I won't have a chance at reaching the top. So a step stool is a must. Plus, I also couldn't reach the top shelf of my closet, and I felt like my purses would go unused if I had to jump up and down and smack them off the shelf all the time. 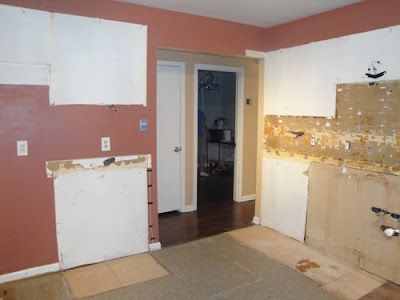 We are planning to rip out our kitchen a week from tomorrow, so no worries, there will be plenty of demo pictures in the near future. But until then, my step stool will have to do. I originally saw this in a Better Homes and Gardens magazine, and then later came across it on the Lost Button Studio blog. It is a beautiful jewelry organizer created out of an old frame and radiator grill. I want to make one really badly, but I'm not sure where I would put it when it was done! I swear, it doesn't matter how much I love something I pick out for my house at the time, I always find something different that I love, and wish I would have done. Lately my biggest regret has been that I have so much straight from the store furniture. After seeing so many DIY projects that others have taken on, I wish I would have gone to garage sales and found old pieces to repurpose. 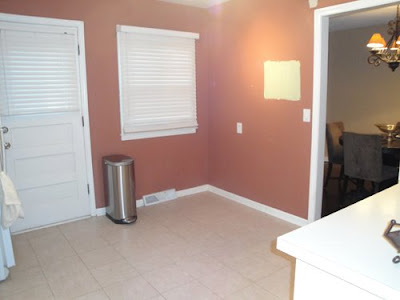 However, after checking out Life in the Fun Lane, I not only wish I have repurposed furniture, but I also am lusting after her mainly white decor. Extremely gorgeous in my opinion. I just don't think I could ever get Chris to go for it! Whose style do you want to steal? I am trying to find a blog layout that I really like. Recently G + D updated her blog layout, and sent me to a site that had several great layouts, so now I am trying to get the colors and widgets just the way I want them. Who knows how long that will take! 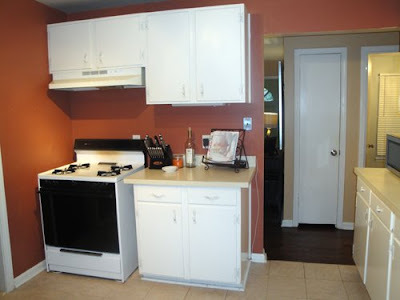 I ordered our kitchen cabinets today! I am so excited! It makes me want to start ripping everything out right now. 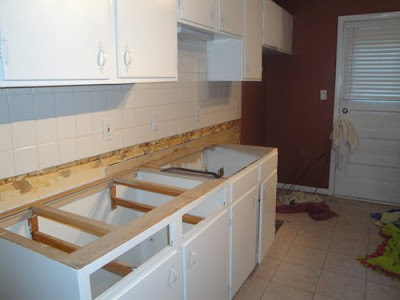 But I'm going to have to round up all my patience because the cabinets won't be here for five weeks. 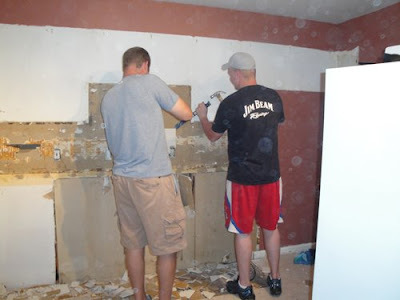 I'm assuming we will start in a couple weeks, but I suppose I shouldn't try and tear out any cabinets before Chris gets home :o).